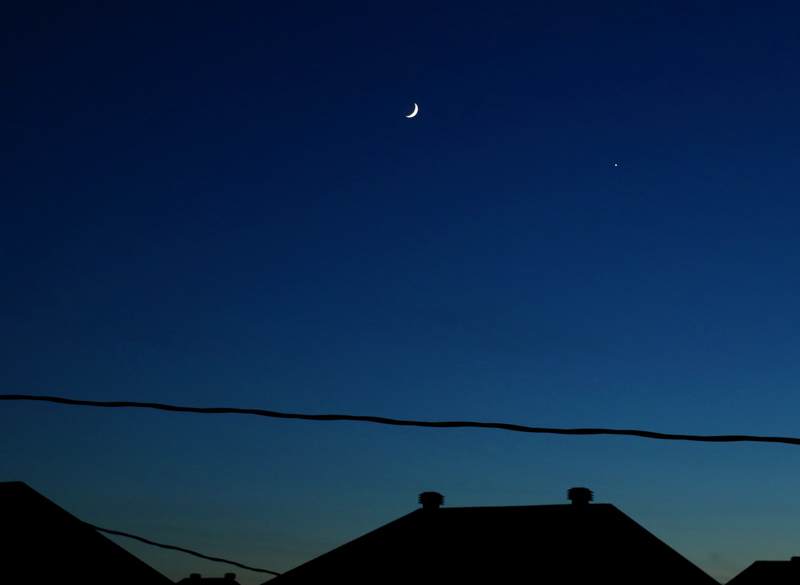 Came home from my piano lesson (yes you can still learn a new instrument past 40) and the sight of a 2-day old Moon and Venus in the dusk sky was stunning. Unfortunately by the time I got home to grab the camera, the sky had darken quite a bit, so I lost my opportunity for some color in the photo. While I did take more close-up photos, I find adding the rooftop in the foreground helps establish scale. 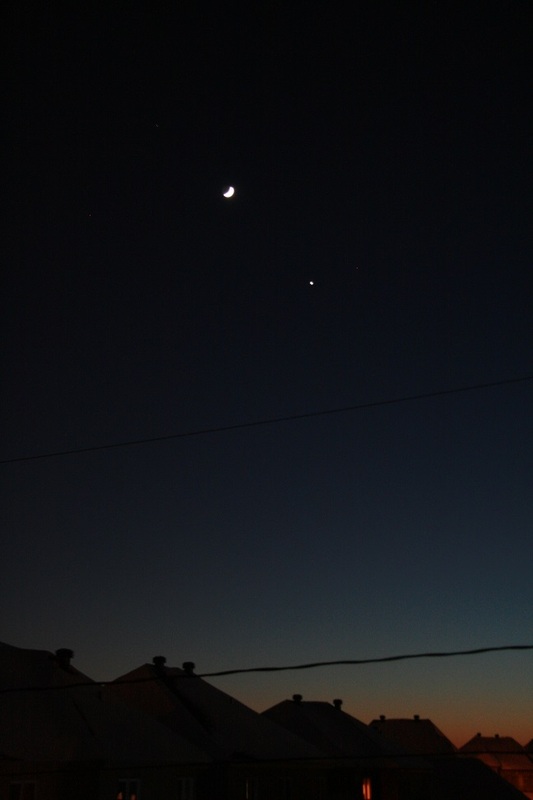 Notice the Earthshine, it was easily picked up to naked eye. If you are able to get out of bed early before sunrise and the sky is clear, you can catch a view of our three closest planets, and if you include Earth that makes 4. Mercury was at the greatest elongation on September 12th (furthest from the Sun when viewed from Earth) which makes it a good time to spot without the glare of the Sun. But it happens that Mars and Venus are also on that same side of the Sun, making a chanced planetary alignment. The sky map below [click for larger] shows the position of Mercury, Mars and Venus for the morning of the 16 to the 19 of September. 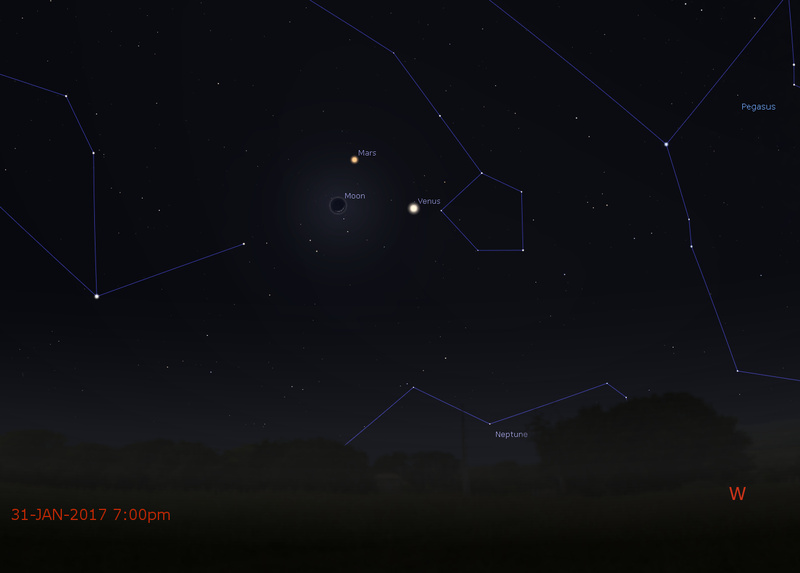 Bright star Regulus and our Moon are also there to make this a worth-while event, especially on Monday the 18th. Mars and Mercury will be closest on the 16th, while the 18th will probably be the most photogenic as the Moon will be a thin crescent in the middle of this alignment. 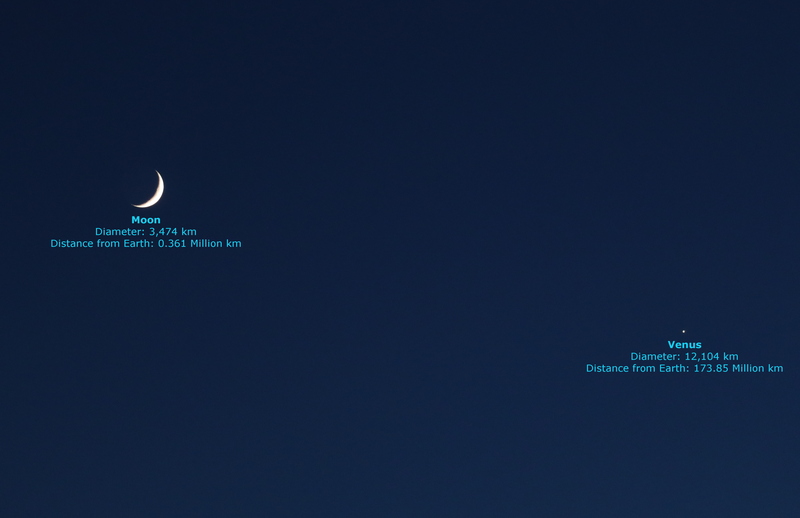 Great photo opportunity tomorrow evening, January 31st, with a thin crescent Moon in a close formation with Mars and Venus. As the sky darkens simply look between South-West and West and you won’t miss them. However don’t wait too late, by 9pm they will have disappeared below the horizon. 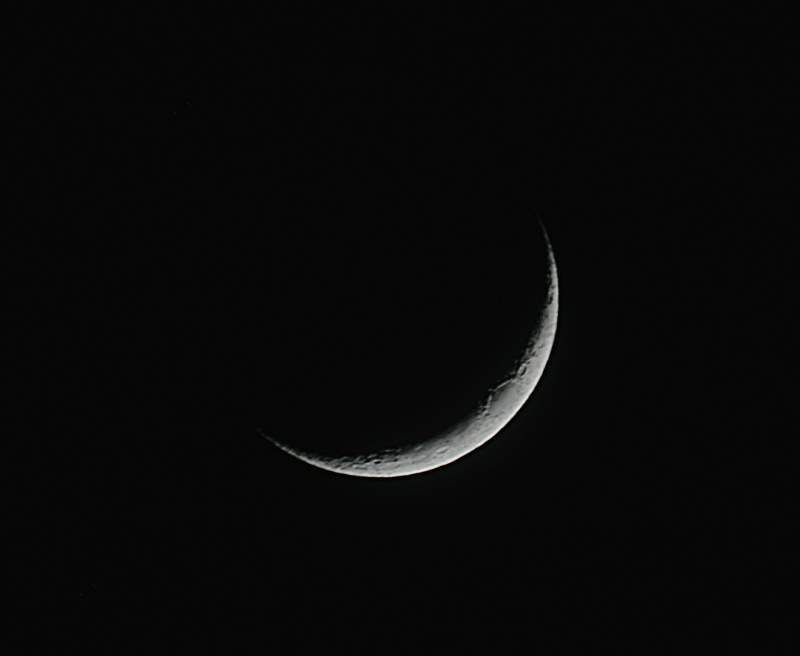 The Moon will be a thin crescent. Here it is as photographed of the Moon tonight at 5:40pm just a little less than 3 days old. No high-resolution photo for this one. 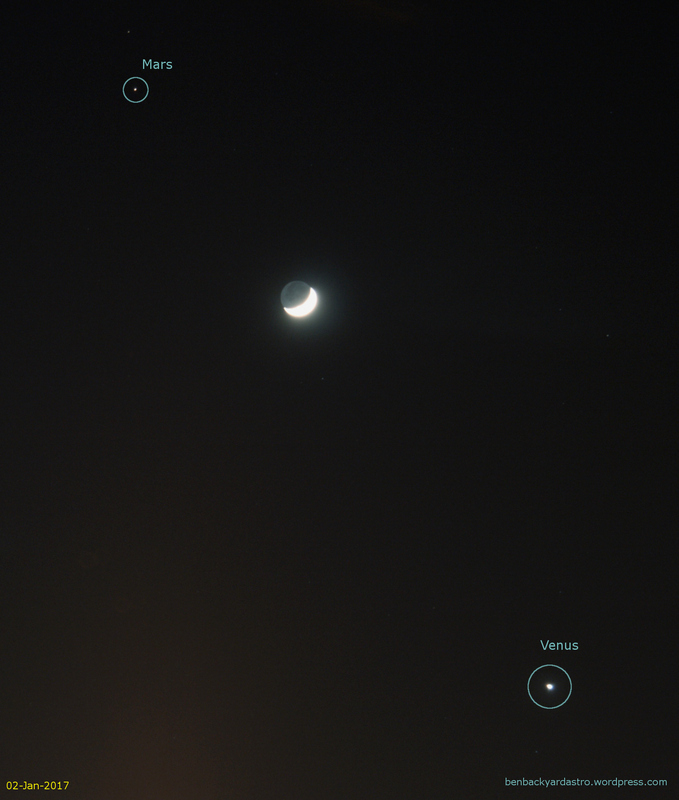 Took it quickly through an open window simply by hand-holding the telescope, and using Venus to quickly find focus through the camera view-finder. After three days of cloud cover and a good 20cm of snow, it was nice to see a clear and crisp sky throughout the day and into the evening. 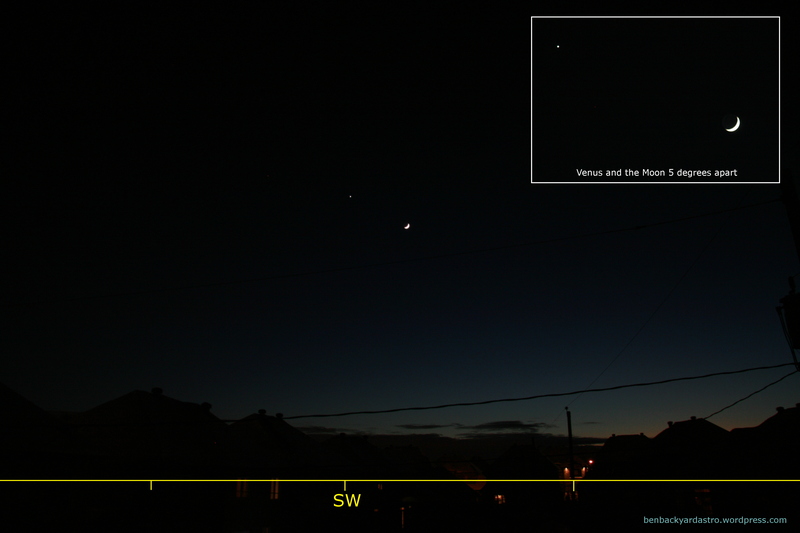 With the sun set and the sky still dark blue a crescent Moon and Venus made for a fine pair in the south-west sky for the first evening of 2017. The Moon will continue to travel towards Mars, located higher up and to the left (East) with a good photo opportunity on the 2nd (tomorrow) with the Moon between both planets. For the rest of January, Venus will gently move closer to Mars to within 6 degrees at the end of the month.